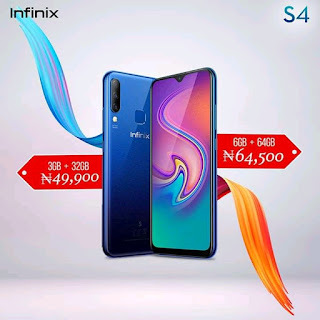 The new Infinix Hot S4 comes with great specs, and of course, The Hot S4 smartphone is available in 2 different variants. Hot S4 comes with 32GB Inbuilt Storage & 3GB RAM while Hot S4 Pro 64GB inbuilt & 6GB RAM. In terms of Infinix Hot S4 specs, The smartphone is a dual (Nano SIM) and run Android 9.0 pie. The phone feature a 6.2inch IPS display with a resolution of 1520x720 pixel. 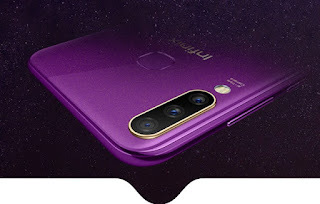 The smartphone spot 32MP at the rear camera with a fingerprint scanner and it also features a 32MP at the front with Led flash. The smartphone is equipped with a massive 4000mah inbuilt battery and its connectivity includes Wi-Fi, Bluetooth, 4G, GPS, and more.